A tandoori without mint chutney!!! Impossible right? Yes this is the best combo among appetizers that will make you pleased in every dip & bite. 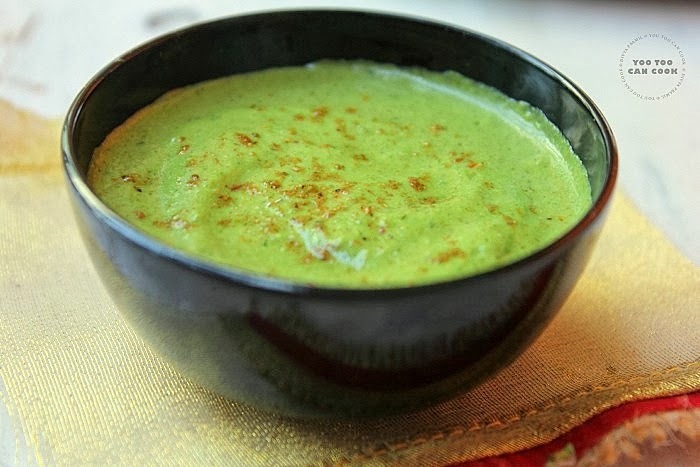 Mint and coriander with curd makes a splendid flavorful dip, that will make you lick off your plates and spoons. I have made this dip/chutney less spicy as I prefer it so, but you can customize it according to your wish. The tang that the lemon gives and the flavors from mint and coriander are just awesome and excites your taste-buds in many ways. Serve this mint chutney with your tikkas, chicken tandoori or use it as a spread in your kati rolls, rotis and bread and enjoy the flavors. I served this mint curd chutney along with paneer tikka which I had posted yesterday do check out the tikka recipe too its just a click far! Add all the ingredients into a blender and blend well until it turns out to be a smooth paste. Transfer to a clean bowl, sprinkle some chat masala optionally and serve with your tikka or tandoori!! TIP 1: I haven't used too much of green chilli, as I wanted my mint chutney to be less spicy, but it depends on how you need it. Add more if you want it hot. TIP 2: It is better to use thick curd, hung curd is not necessary but still thick curd will give you a dip with better consistency. The dip should not be watery/runny. Finger-licking, flavorful chutney/dip to accompany your tandoori or tikka is now ready!! A very healthy and creamy dip. love your Photography. so inviting dish. very yummy dip and beautiful clicks especially last snap. Perfect chutney with Awesome clicks. Definitely looks finger licking good! very very delicious and creamy chutney :) looks so inviting !! amazing clicks dear !! Drooling here over the last shot. Wow. Love this flavorful and delicious chutney. Lovely clicks. Looks really delicious.. Nice clicks..